Before too long, Bethesda residents will be enjoying their meals on real china with crisp ironed linens, delivered efficiently by uniformed wait staff who will help provide an experience rivaled only by the finest of restaurants. National HealthCare Corporation (NHC), one of the nation’s leading operators of senior care services, awarded Villa Crest Nursing and Retirement Center the highest NHC honor this year: the Center of the Year award. In addition, Villa Crest received NHC’s Five Star Excellence Certification Award, the premium category for operational performance. It recognizes the outstanding services provided by the center’s staff and publicly recognizes the center and its staff as one of NHC’s best. Villa Crest embraced Kind Dining® Training in 2010 when they revamped their dining service and won the 2011 Optima Award from Long-Term Living Magazine. 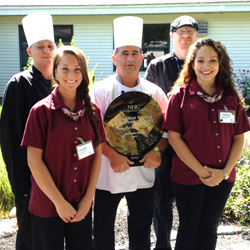 Congratulations to Administrator Sarah McEvoy, Chef Manny Perry, and the fantastic team at Villa Crest! Photo Credit: Long-Term Living Magazine. From left to right: Villa Crest Administrator Sarah McEvoy, Long-Term Living Editor-in-Chief Patricia Sheehan, and Villa Crest Executive Chef Manny Perry. PORTLAND, Ore. — The Villa Crest Nursing and Retirement Center of Manchester, N.H. dramatically increased meal revenue while also improving both customer and staff satisfaction just over a one-year period. The efforts earned Villa Crest the national 2011 Optima award presented by Long-Term Living Magazine for innovative, outcome-oriented staff teamwork in long-term care communities. Key to the Center’s success is the innovative Kind Dining® training it implemented from the Portland, Oregon company, Higher Standards, LLC. The training transforms and elevates the dining experience in senior living communities. Kind Dining®: Bringing Warmth to the Table is a 9-module training series developed and taught by service and nutrition expert Cindy Heilman, MS, DTR. The unique training is designed to incorporate hospitality and empathy with proper serving techniques. Research clearly indicates that residents who are highly satisfied with meals, food and the dining experience are more satisfied in their living environment and healthier overall. On a typical day, many residents spend as much as 60 percent of their time preparing for, engaging in, or returning from meals. Villa Crest staff embraced Kind Dining® training as they embarked on a significant dining room overhaul, moving from a traditional approach with limited options and a rigid daily schedule to a new restaurant-style dining experience called CHOICES. Villa Crest improved the menu and service by offering freshly-made fare, adding flexibility to the dining room hours of operation, and implementing principles of hospitality through Kind Dining®. The dining experience was transformed to focus on resident-centered care and satisfaction. After the training, staff understood the importance of meal service from the residents’ perspective. The CHOICES restaurant was implemented in April of 2010. In a little over a year, Villa Crest increased its guest meal revenue by an impressive 80%. The changes also resulted in increases in resident and staff satisfaction scores. 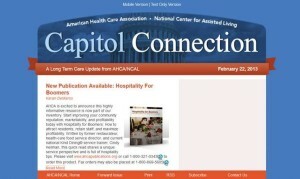 Additional evidence gathered by Villa Crest indicates that social activity has increased and personal connections among residents have been enhanced by the culture change in the dining room. “Kind Dining® training truly transformed our operation. Everything from small details like having servers understand how to respectfully address our residents to providing extended hours of meal service resulted in a significant improvement in our meal revenue and resident satisfaction. People aren’t born knowing how to provide good service—they need to be taught. I’m grateful to Cindy Heilman for her expertise,” said Sara McEvoy, Villa Crest administrator.